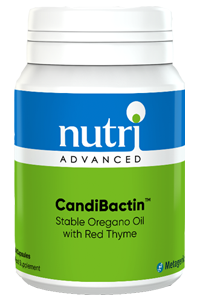 Nutri Advanced CandiBactin is a blend of concentrated essential oils and herbal extracts from the aromatic mint family. 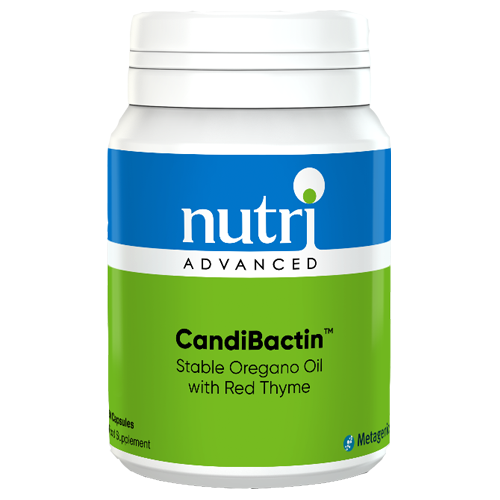 Nutri Advanced CandiBactin contains essential oils from oregano and red thyme. Oregano can be used to support digestion. Nutri Advanced's unique encapsulation technology allows the essential oils to be blended with dry leaf extracts of sage and lemon balm - herbs that complement and stabilise the fragile essential oils. 1 capsule three times daily, or as directed. Encapsulated with: gelatin, glycerin, Lecithin, rice bran oil, silica. Not recommended during pregnancy or whilst breastfeeding. If taking any kind of medication or have a medical condition, consult a healthcare practitioner before using this product.